Dr. Ravindra Kumar is a renowned Indologist; he is a former vice chancellor of CCS University, Meerut, India. India is a country committed to internationalism or universalism. This commitment is thousands of years old and can be well acknowledged and understood through India’s ancient slogan of ‘Vasudhaiva Kutumbakam’. Besides this, thousands of years old harmonious and evolutionary Indian Culture, through the practices of its up bingers, Indians, has also been categorically reiterating its commitment towards internationalism. Until today it is doing so. India’s Culture along with its other unique and exemplary characteristics, of which adaptation and universal acceptance are the foremost, has been drawing the attention of the whole world by opening the door of the Indian soil for each and every one, doesn’t matter to which part or region of the glob he or she belongs. This, definitely, has been an outstanding step towards internationalism. For all the nations and citizens of the world it is a good lesson to be learnt. Particularly, in these days of globalization, which is another form of internationalism, which is constantly decreasing distances among the nations at different levels and different walks of life, and in which marching forward together has become necessary, Indian Culture and its exemplary features can guide the world for the establishment of a true internationalism and also to make it firm and all welfaristic. It was Indian Culture and its large scope that accorded protection to the followers of various faiths and beliefs of the world from time-to-time. This Culture opened doors for all to settle on the Indian soil and provided equal opportunities to them for development. This process started thousands of years ago and continued for centuries. Perhaps, such kind of exclusive and excellent work started in India alone. India’s commitment to internationalism can also be well observed in its respect to Ahimsa, non-violence, the supreme human value. In other words, Ahimsa being an indivisible part of day-to-day practices of Indians calls upon human welfare at the highest level and thus makes the idea of internationalism firm and great. It works for human unity. “Not to inflict others’ thoughts, words and actions by our own thoughts, words and deeds, simultaneously not to spoil the life” is included in India’s concept pertaining to Ahimsa. In brief, “The aloofness in toto from Himsa-violence is Ahimsa-non-violence.” It is evident that not only human beings but all living beings are within the domain of India’s concept of non-violence. Now, where there is such a feeling for living beings, how much regard will be there for human beings? We can understand it from India’s concept of non-violence and through it can realize India’s commitment and dedication to internationalism and universalism. Indian philosophy, spiritual thinking and education and messages of those great men, reformers and initiators of new ages who born on India’s soil from time-to-time, called upon people to carryout their day-to-day practices having larger interest of humanity in the centre. They urged people to base their behaviour on the principle of ‘Vasudhaiva Kutumbakam’. They declared nationalism to be the first stage of internationalism and inspired people to strengthen it with the purpose of prosperity and welfare of the whole world. Therefore, India’s concept of nationalism is not a narrow one, or in it not ungenerous in its nature. I repeat it is the early step towards internationalism. Those who consider Indian nationalism to be narrow in outlook or observe it to be isolated, they must understand its reality. They should go into its roots. If they do so, I am sure they will find it completely free from the state of isolation. They will definitely find it to be dedicated to internationalism or universalism. Mahatma Gandhi, who was a worshiper of Ahimsa and a forerunner of India’s Culture in his time, had said, “If I want freedom for my country…I do not want that freedom in order that I, belonging to a nation which counts one-fifth of the human race, may exploit any other race upon earth, or any single individual. If I want that freedom for my country, I would not be deserving of that freedom if I did not cherish and treasure the equal right of every other race, weak or strong, to the same freedom.” This statement is fully capable of clarifying the reality of India’s commitment to universalism. Simultaneously, his following statement is also equally relevant and significant in this regard:“ Through the deliverance of India, I seek to deliver the so-called weaker races of the earth from the crushing heels f Western exploitation. India’s coming to her own will mean every nation doing likewise.” Mahatma Gandhi’s principle of Sarvodaya, which is in consonance with Indian traditions and values and which is also influenced by Ruskin’s theory of ‘Unto This Last’, can be considered to be the best on the way to human equality. This principle without any caste, class gender, community or territory-based discrimination endorses equal value for the labour of an intellectual or a cultivator. It talks of greatest happiness to all in comparison to utilitarian theory of greatest happiness to greatest number. In it is the room for equal opportunities for the lowest to progress. This firmly elucidates that in greatest happiness to all also includes the greatest happiness to greatest number. Hence, it brings the whole humanity in its fold and, therefore, reveals internationalism in a beautiful manner. Furthermore, Gandhi’s theory of Trusteeship, which according to the Mahatma can be the alternative to the violence-based institution like the State, clearly reflects the perception of internationalism. He as one of the great anarchists is in favour of abolishing the institution of the State step-by-step. In place of the State he stresses upon the establishment of a worldly order based on equality. It is in fact a step beyond internationalism. In it whole humanity without any discrimination and territorial limit comes together and becomes identical. Therefore, Mahatma Gandhi’s views cannot be taken slightly, doesn’t matter if the institution of the State as desired by him cannot be abolished immediately or within a time fixed for the purpose. His views are worth giving a thought, doesn’t matter if his desire for a worldly order seems to be utopian to many. In this regard Gandhi during his stay in South Africa had set an example of collective living in the ‘Tolstoy Form’. In it people belonging to different religious-communities, sects and castes stayed together. They worked together and ate together. It was a successful experiment of Gandhi. Therefore, his ideas, in spite of seeming utopian or impractical and fully imbibed with morality and ethics, are the subject of minutely analysis as they are important and significant for the establishment of internationalism. Eighty-five years ago, in 1924, Mahatma Gandhi had said, “The world desires today not absolutely independent States warring one against another, but a federation of friendly interdependent States. The consummation of that event may be far off. I want to make no ground claim for our country. But I see nothing grand or impossible about our expressing our readiness for universal interdependence rather than independence.” This statement of the Mahatma adds to the concept of internationalism. It makes its range to be large. It is possible that eighty-five years ago the above statement of Gandhi seemed just to be imaginable to many. But, today in completely changed circumstances of the world it calls upon us to think over it honestly and sincerely. Due to constantly increasing development at the global level, in spite of existence of independent nation-States, an advanced state of interdependence is before us today. This state will still go higher. Doesn’t matter if it is considered to be a compulsion of the nations of the world, but to move forward together is inevitable now. Working together is necessary for all citizens of the world. 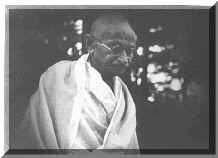 In such a situation suggestions of the Mahatma and views expressed by him from time-to-time, which are full of internationalism, prove their adaptability and significance. It will be better and welfaristic if nations of the world by having the views and suggestions of Gandhi in the centre come forward to work in a state of harmony as per the demand of time and space instead of working in a state of compulsion. If they create conducive atmosphere collectively it will do well to all in the world. In the beginning we have discussed about India’s commitment to internationalism. Mahatma Gandhi had desired India to come forward for the establishment of a worldly order dedicated to peace and prosperity. He also desired India to accomplish this gigantic task considering it to be her responsibility. It is possible because India due to its unique values, exemplary Culture and commitment to non-violence is capable to do so. Therefore, India must come forward for the establishment of a true and real internationalism, and by doing so it must become ideal for others in the world.